This 11-piece set was crafted by Hope Ceramics, a society of local artisans in Addis Ababa, Ethiopia, who have hands-on training gained from 9 years in the production of artistic ceramics. They have trained with artisans from Europe and the USA. They now train other local artisans in ceramics. Their items focus on Ethiopian artistic traditions and context, using local raw materials and many of the same techniques that Ethiopian potters have always used. 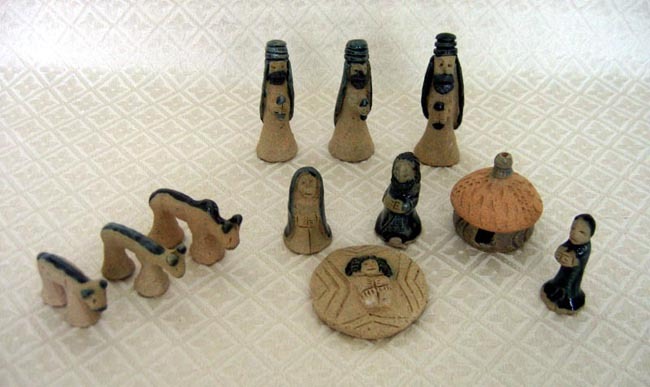 The set includes Joseph, Mary, Jesus, three wise men, a shepherd, and three animals (a cow, a zebu cattle with the hump on its back, and a longhorn sheep). The tallest wise man measures 3 inches tall. The set also includes a tukul, an Ethiopian hut made of a wooden frame and then covered with mud, hay, and manure to form the walls, and finally covered with more mud. A unique feature of this set is the square cross across baby Jesus’s body. The square cross is the symbol of the Ethiopian Orthodox Church (also known as the Coptics). This church is considered the oldest Eastern Orthodox Christian church in the world and is also the largest with 36 million members worldwide. Another unique feature of this set is the blue glaze on the pieces. African Nativities are typically void of added color, with an emphasis on using only natural woods, stone, or clay. The added blue glaze makes this set very unique. The set comes in a bag that has been decorated with the Ethiopian flag.